Da Vinci Diamonds Masterworks slot is IGT’s homage to one rather extraordinary individual of many talents- Leonardo Da Vinci. It’s filled with more colour than you could find in a Florentine studio, has a Tumbling Reels mode that makes for long strings of winning combos and different multiplier effects and bonuses. Do read on for more details of the spinning feast that’s on offer. Spin Up Life With Da Vinci Diamonds Masterworks! 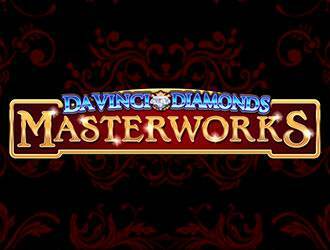 The Da Vinci Diamonds Masterworks slot has all of 5 reels, along with 30 paylines. Gameplay is accessible to all devices and all comers, with 40p and ₤800 being the lowest and highest bets per spin respectively. The icons used in consists of varied precious stones like diamonds, amethysts, emeralds, rubies, pearls and topazes. There’s also images of Da Vinci himself and portraits of the Madonna and Mona Lisa. Fittingly, the latter is the most lucrative icon there is and by getting five of it laid out along a payline players can receive 25x their stake. There’s also a Da Vinci Diamonds icon that rewards players with 125x the stake when 5 of it gets landed across a willing payline. Tumbling Reels-here, once winning combos are formed, the icons that compose it vanish, with the empty spaces being speedily filled as more icons tumble into place from above and hopefully form winning combos. This process can go on for a surprisingly long time and enhances wins. Giant Portraits Feature– here, massive 2×2 Portrait icons show up on the reels. Should any one of them be part of a winning combo, multiplier effects of from 2x to 4x get applied to wins. Mystery Portrait Feature– in this bonus feature, a non-winning Giant Portrait icon can transform into another Giant Portrait icon and guarantee a win. Portrait Scatters Bonus Feature– here, more of the Giant Portrait icons show up than during the base game and these icons have the same payouts as scatters when there is at least a quartet of them on the reels. Boosted Multipliers Bonus Feature- here, more of the Giant Portrait icons appear on the reels and sport heftier multipliers that max out at 6x. However, by acquiring multiple multipliers, these can be combined to a max of 36x. Gigantic 2x Wilds Bonus Feature– here, more of the Giant Portrait icons and wilds appear than is possible in the base gameplay. Also, 2×3 wild icons can show up on all the free spins and double the payout when they form part of a winning combo. Should there be multiple Gigantic Wilds, the payout is multiplied according to the multiplier combos that is in effect. More free spins are accessible during this bonus mode once players repeatedly land more of the bonus scatter icons on the first, second and third reels. In total, up to 300 free spins are up for grabs during the free spins bonus mode. Apart from the above, there’s also something called a Second Chance spins. This takes effect following the last awarded free spins in the free spins round and can lead to the award of from 1 to 6 extra free spins. The Da Vinci Diamonds Masterworks slot is decidedly packed to the rafters with features and bonuses, has lively graphics and animation and plays as sweetly as a masterpiece from Da Vinci himself!